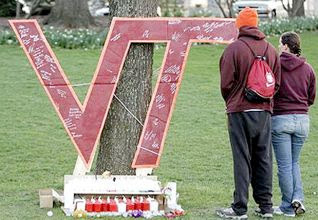 Today, as I write this piece, I can't get the tragic events at Virginia Tech yesterday out of my mind. The convocation from that stricken university is on the television behind me, where speakers, including President Bush, have expressed many of our thoughts. It's hard to comprehend how such a terrible event could occur. It's impossible to fathom what was in the mind of that troubled young man, Cho Seung-hui, as he methodically went about slaughtering those innocent people. Once again, this kind of event has reached out and grabbed this country by the throat. The images and sounds of that day were looped endlessly throughout the day yesterday, making it impossible to avoid the agony being felt by those in Blacksburg. Many of us look around and say to ourselves, "If it can happen there, it could happen here, too!" Tonight our City Council will debate a program addressing the growing gang problem in Costa Mesa, trying to decide which path our city will take on this difficult issue. Some apparently feel that only enforcement is necessary control this problem, giving no credence to the experts in this field that tell us a comprehensive program of prevention and intervention is essential to nip gang involvement at the roots. Some will say that the Truancy Ordinance, which is presented as an important segment of the CMPD's plan, is draconian - a step that will only alienate the broader community in an attempt to control the actions of a relative few. I'm still willing to hear the reasoning behind this plan before offering a final opinion. If the leaders of our police department feel this program has critical value in our fight against gangs, I'm willing to hear their views. I expect to hear residents, including some parents and students, speak on this subject tonight and I hope our elected leaders will listen and deliberate before stating their decision. Tonight will be another test of the leadership of this city. Tonight we find out if they will, in fact, be the leaders most hoped for when they were elected, or will they pander to the vocal, intolerant few among us. Will they listen to the testimony of their experts and of the concerned residents of this city before making the decision? We'll see.